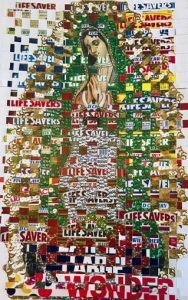 Wonders Never Cease features Hughes’ paper weaving collages that combine secular and divine images into icons of a thought-provoking new reality. 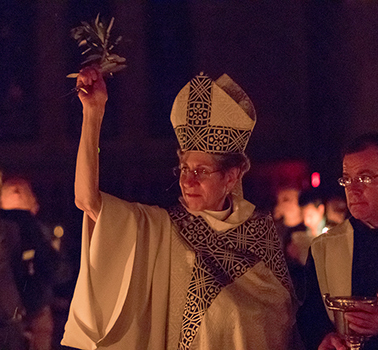 The exhibition opens at the beginning of Holy Week, during which believers are called to be at one with the passion of Jesus culminating in his resurrection on Easter Sunday. Her work engages the viewer in a visual pilgrimage to discover new and deeper revelations about life. The wonder of new life implied by Easter is also exemplified in Hughes’ inspired floral watercolor/collages depicting fields of red poppies, a basket, brim full of floral enchantments and a glass vase of gracefully twisting tulips. In addition, dried, pressed and painted golden Galax leaves mingle with pomegranates, angels, and a squirrel and a rich egg-yolk colored hibiscus is open to be admired. These golden paintings spring from the heart of a consummate gardener and floral designer. Hughes works in a wide spectrum of media, including watercolor collages, assemblages, installations and paper weavings. 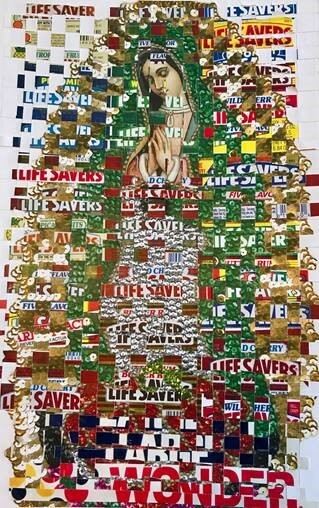 Her signature paper collages weave together contemporary secular images with more traditional images of the divine, illuminating a fresh, understanding of the meaning of life and spirituality, as do her assemblages and installations. Hughes’ color saturated watercolor collages are expressions of the beauty of nature. She and her husband, The Rt. Rev. Gethin B. Hughes, lived in La Jolla for 12 years, when he was Bishop of the Episcopal Diocese of San Diego. Upon his retirement in 2005 they returned to Santa Barbara. In Santa Barbara, Lenore has expanded her art into creating pop-up, bespoke art installations for Nordstrom, Santa Barbara, and is the designer of the Maze and Wooded Dell at the Santa Barbara Botanic Garden, where she recently had a four-month show entitled The Reason for the Seasons based on stories from Greek Mythology. 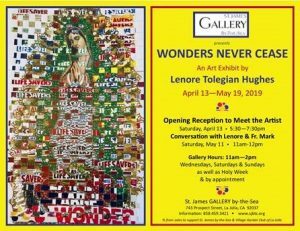 Hughes’ paintings, collages, and installations are on exhibit from April 13-May 19, 2019, in St. James Gallery by-the- Sea. The Opening Reception to meet the artist is on Saturday, April 13, 5:30-7:30 pm. 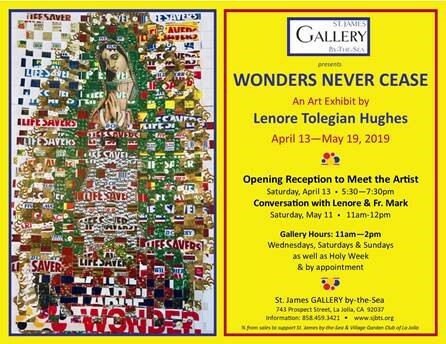 Gallery hours are 11 am -2 pm on Wednesdays, Saturdays and Sundays, before and after church services, during Holy Week and by arrangement with the church office for individual and group visits. For further information call 858 459-3421 or visit www.sjbts.org.